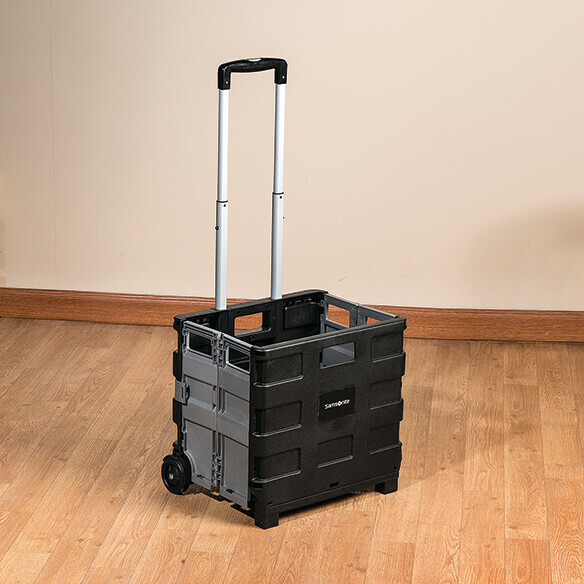 Save your back with a trolley that organizes then transports your load. 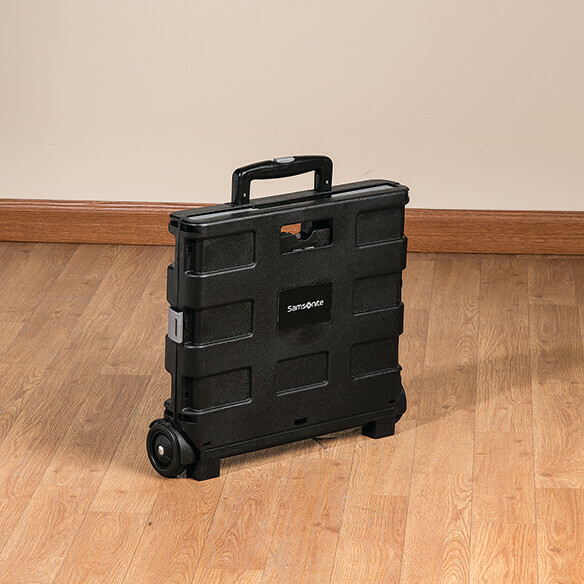 Durable plastic Samsonite Pack and Roll Cart is perfect for storing cleaning supplies, gardening or household tools, books and more. When it’s time to move, simply extend the comfortable haul handle and conveniently roll it wherever you need it. 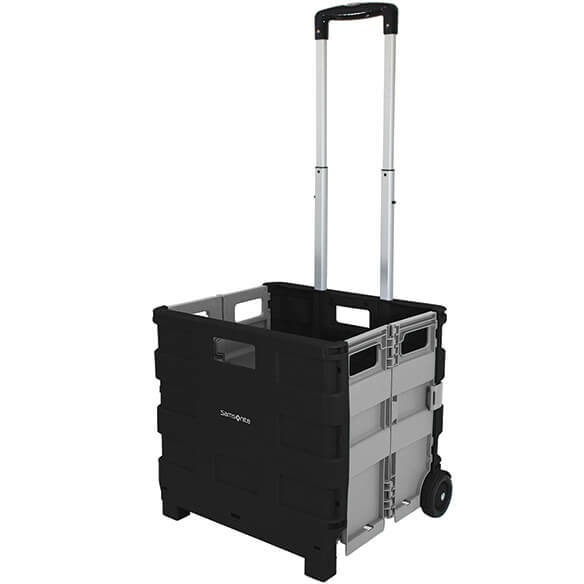 Utility cart folds flat for storage when not in use. Collapsible cart measures approx. 15” x 14 1/4” x 11 3/4” open; 15” x 14 1/4” x 3 1/8” closed. Height with handle extended is 33 3/4” from floor. Holds up to 40 lbs. Makes hauling groceries easy, also use it for hauling my wash. It is constantly being used for one reason or another. I would not want to be without it. Works great to carry grocery bags from car to house. I am disabled and this will help with carrying items while walking with my cane; laundry, groceries, etc. 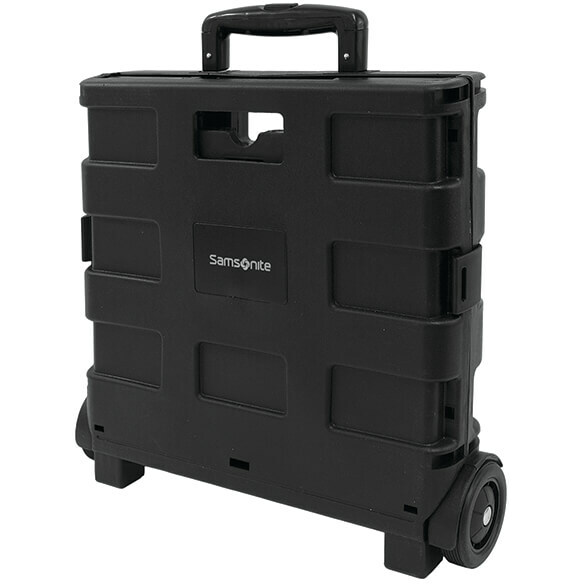 I am looking foreword to receiving this cart made by Samsonite, a long trusted company. Need this to help bring shopping in from car. More convenient than the crates we usually pick up and carry. If they are good quality they will be worth it. Perfect for carrying items to/from car from apartment/grocery store. Have one like this and use it for multiple purposes. It is very handy to have. I'm having balance issues want to use it to pick up laundry and move things from one area to another. Because I need 1 of these. I had one before. Best little cart to get around with. Bought one 8Yrs ago. Rugged, super convenient, requires very little storage space. I have hauled 2 24ct. cases of water on it. Wouldn't recommend this frequently but it's handled it. Finally wore mine out. really good product. Buy one you'll be glad you did. Picked for price & size.....have been shopping for one for some time. Look like great help for me when I'm alone shopping. Had one for a long time. Wore out did not break. What weight can it carry? BEST ANSWER: Thank you for your question. The cart can hold 40 pounds. We hope this information will be of help to you.